If you visit Italy and are a cheese lover, you really will be spoilt for choice. Each individual Italian region, city and village boasts a myriad of typical local cheeses with each product representing the area’s cultural and farming heritage. There are so many Italian cheese recipes associated with the Italian cheeses that we feature in our hampers, it is always hard to select just a few – they are all incredible. In this small selection, we have chosen some simple recipes with that we think you will love! These recipes are easy and yet taste amazing and create a great impression! Castelmagno is one of the most ancient Italian cheeses, it’s firm, dry and granular, sometimes blue and dissolves in your mouth. It tastes wonderful by itself and even better in a sauce with risotto or pasta – an experience not to be missed! Step 1. Chop your onion finely and let it fry in a pan with the oil and butter over low heat for about 10-15 minutes. Step 2. Raise the heat and place the rice in the pan and toast it for about a minute, stirring constantly; add 2-3 ladles of stock and continue cooking adding the rest of the stock, a little at a time, when needed. Step 3. In the meantime, place your peeled hazelnuts on a baking sheet and toast for a few minutes in the oven at 200 degrees until they become crunchy (be careful not to burn them ); let them cool and then chop coarsely . Step 4. 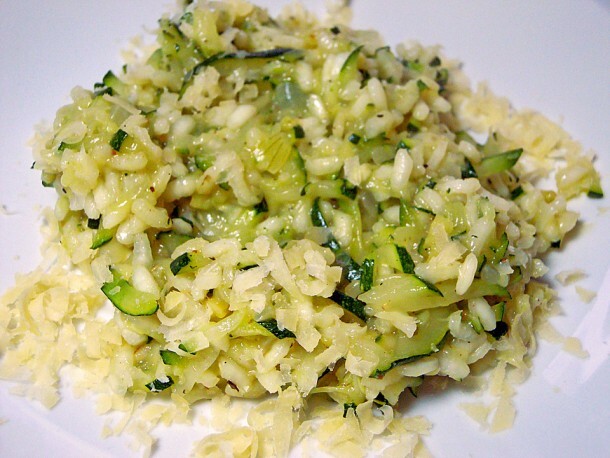 When the rice is al dente, turn off the heat, add the grated Castelmagno, stir and mix it together with a knob of butter. Step 5. Serve, sprinkling the dishes with chopped, toasted nuts and some thin flakes of Castelmagno. Asiago is one of those Italian cheeses with a strong personality and when it is extra mature it has amomatic notes that explode in the mouth – it goes perfectly in a simple sauce to accompany Fettuccine with just a little butter and salt added. Step 2. Sauté the fettuccine in a pan with the butter and the Asiago that you will have previously cut into thin slivers . Step 3. Serve immediately whilst nice and hot. The one hundred litres of milk in one Fontina make this one of the creamiest Italian cheeses. It melts perfectly to make a delicious sauce to accompany these gnocchi which are a lighter version of the traditional potato ones. *If you prefer to use normal potato gnocchi, those are fine too! Step 1. Sieve the plain flour in a bowl then the buckwheat flour in the same bowl. Add warm water to the sifted flours and mix them with a fork. Add a pinch of salt to taste. Keep stirring until the ingredients are blended and then knead the dough firmly with your hands until the mixture is smooth and homogeneous, with a soft texture but compact. Step 2. Give your dough the shape of the ball then cover it with cling film and let it stand for at least 1 hour at room temperature. Step 3. Proceed with the preparation of the Fontina sauce by placing the cheese on a cutting board and cutting off the outer crust. Cut the cheese into strips and then into cubes of about 1cm. Step 4. Take a pan and pour in the milk. Heat and add the cheese. Melt the cheese over low heat, stirring well with a wooden spoon or spatula. The cheese should melt completely and blend well into a milky cream without producing lumps. Add pepper to taste. When the cheese is melted and totally free of lumps turn off the heat. Step 5. Take your dough and knead it on a surface where you will have spread some flour first. Break off a piece of dough and form a 1cm thick snake that you will then cut into small pieces all the same size. 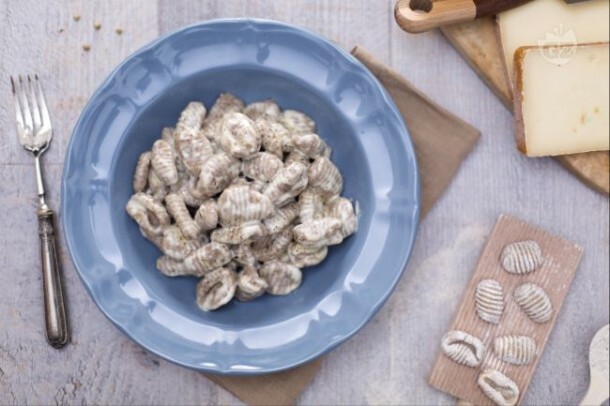 Give each small piece a classic gnocchi shape by rolling on a gnocchi basket if you have one or with a fork. Repeat this for each one. Step 6. Fill a large pan with water, add salt and bring to a boil. When the water boils pour in the gnocchi. When they bob to the surface, after about 3 or 4 minutes, they will be ready. Drain the water and place them in a bowl. Step 7. Add the Fontina sauce to the Gnocchi and mix well. Serve hot. This is one of our favourite Italian cheese recipes! And if you love spicy Italian cheeses then this dish is for you! 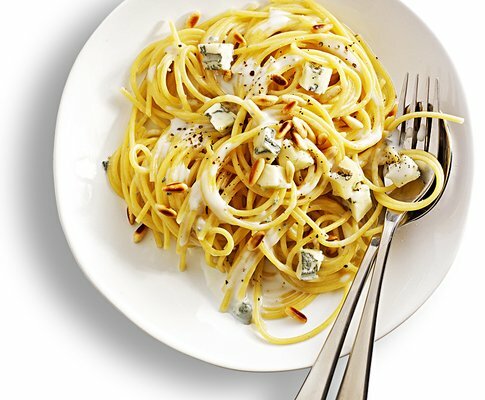 Gorgonzola piccante is creamier than Stilton but just as strong and works perfectly with spaghetti in this easy to prepare dish. Step 2. Meanwhile, remove the rind from the Gorgonzola and cut the cheese into small pieces. Step 3. Chop the pistachios. Step 4. Put the Gorgonzola in a saucepan and add the cream, cook over low heat for 3 minutes, stirring constantly. Then stir in the Parmesan. Step 5. Drain the pasta and place in a large bowl, pour in the creamy Gorgonzola sauce and stir again to coat the spaghetti, if the sauce is too thick, add a little of the pasta cooking water. Step 6. Serve hot with a sprinkle of fresh ground pepper. Toma is a buttery but salty mountain cheese from Piemonte which brings the components of this risotto together really well creating a simple but delicious dish. Step 1. Fry the onion in the pan with 2 tablespoons of olive oil. Step 2. Add the courgettes and stir-fry gently. Step 3. Add the rice, toast for a minute or two and then pour in the wine. Step 4. After the wine has evaporated, pour in the stock one ladle at a time and after each ladle, cook the rice until it has absorbed all the stock. Step 5. Towards the end of cooking, add salt, ground pepper and sprinkle with thyme and parsley. Step 6. Remove the pan from the hob and add the chopped Toma cheese and the butter. Serve sprinkled with grated Parmesan. Fruity and creamy with a soft texture, Taleggio works really well in a quiche. It’s milky flavour compliments the peppers without over-powering them. Or – ready-made short crust pastry of course! Step 1. Sieve the flour into a large bowl, place it on a surface in a mound , make a well and put the butter in the centre. Mix the flour with the butter by rubbing it with your fingertips until you get large crumbs. Step 2. Shape into a mound again and pour in 5 or 6 tablespoons of cold water and knead quickly. Form a ball with the dough, wrap it with cling film and let it rest in the fridge for at least an hour. Step 1. Roast or grill the peppers until the skin wrinkles. Let them cool covered with a plastic wrap, then peel them and cut into strips, removing core and seeds. Step 2. In a bowl beat the egg with a pinch of salt, pepper and cream. Add the peppers, thyme and chopped Taleggio cheese. Step 3. Butter and flour a quiche/cake tin, roll out the dough with a rolling pin making it a half a centimetre thick and line it in the tin. Step 4. Pour in the mixture of peppers, then bake in a preheated oven at 200 for about 30 minutes, until the dough is golden and the filling has solidified. 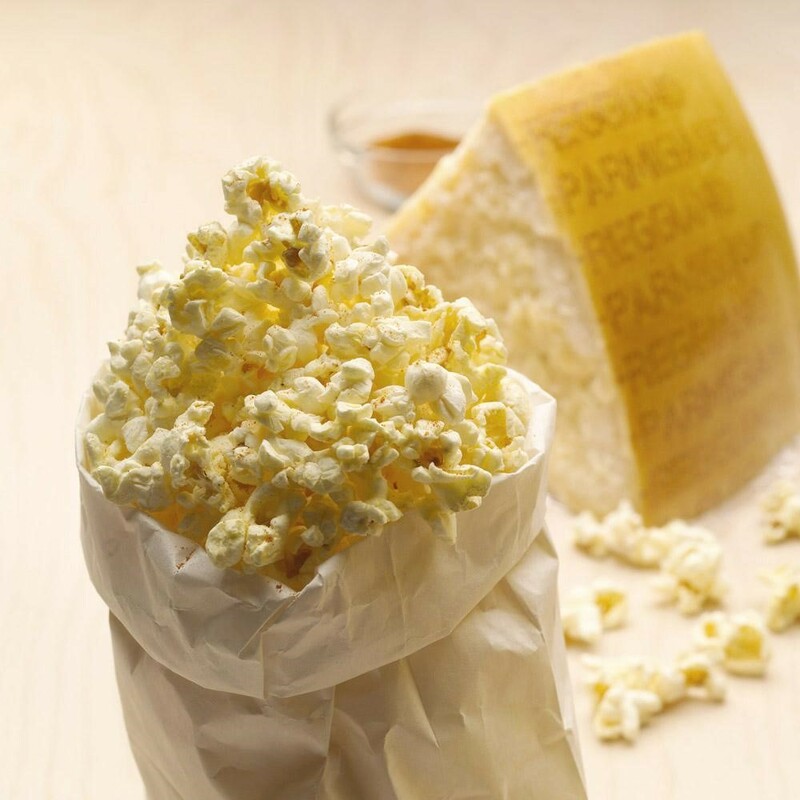 Take your popcorn to the next level with a good dusting of the King of Italian cheeses, Parmigiano Reggiano! Step 1. Prepare the popcorn according to the directions on the package. Step 2. While still hot, pour in the Parmigiano Reggiano and shake well so that it is evenly distributed. If you wish, you can add some powdered pepper or paprika too. Vorrei’s cheese hampers feature a range of carefully selected fresh Italian mountain cheeses. We make sure that our cheeses are as natural as possible and do not contain any additives, preservatives or colourants. Please let us know if you try any of our Italian cheese recipes and send us a photo of the results of your hard work!